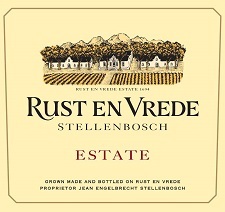 In the May issue of the Wine Spectator, James Molesworth has words of high praise for the latest vintage of the Rust en Vrede blend that expresses the full uniqueness of the Stellenbosch estate. “A dense red, displaying dark currant, fig and blackberry fruit, layered with charcoal, grilled savory and tobacco notes. An iron edge underpins the finish, adding length and cut to match the heft. A serious Cabernet blend. Cabernet Sauvignon, Shiraz and Merlot. Best from 2015 through 2020. 3,750 cases made.” – J.M.